The typical size and operational roles of high-speed naval vessels have increased over the past decades, which has led to operation in more extreme environments. This increasing operational tempo, and susceptibility to slamming, has driven interest in improving structural assessment methodologies for high-speed craft (HSC). To ensure that a new acquisition will meet its intended life, or to check that in-service modifications to the structure or operational profile do not substantially reduce the design life, a fatigue assessment is required. In many of the classification society rules the allowable stress approach is assumed to implicitly account for fatigue, by applying safety factors due to material, weld filler, and the criticality of the structural item. However, examples of recent fatigue failures of lightweight naval craft demonstrate that a more direct approach to assessing fatigue is needed. Further, the need to evaluate the random nature of fatigue life estimates is increasingly being recognised. For high-speed craft the stochastic nature of slamming phenomena, and the ability to reliably identify the number and severity of slam events, warrants the use of probabilistic fatigue analysis. 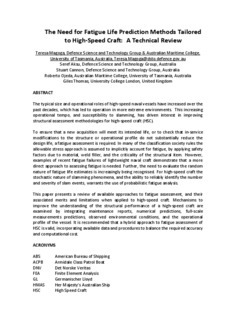 This paper presents a review of available approaches to fatigue assessment, and their associated merits and limitations when applied to high-speed craft. Mechanisms to improve the understanding of the structural performance of a high-speed craft are examined by integrating maintenance reports, numerical predictions, full-scale measurements predictions, observed environmental conditions, and the operational profile of the vessel. It is recommended that a hybrid approach to fatigue assessment of HSC is valid, incorporating available data and procedures to balance the required accuracy and computational cost.